Hair Color: Black Eye Color: Dark Brown Height: Medium Family: Yamazaki Ayumu (sister) Department in Shinsengumi: Intelligence Position in Shinsengumi: Supervisor and Shinobi Quotable Quotes: 'You're a halfwit' 'These escape wounds are dishonourable' Yamazaki Susumu is held in high regard by the high-ranking members of the Shinsengumi, especially Hijikata. 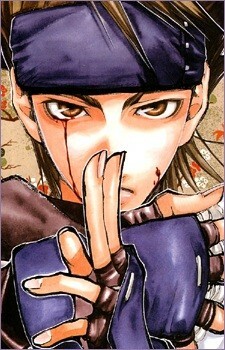 Obviously as you can figure out, Susumu is a shinobi and the type that gathers information both night and day. Like a typical ninja, he leaps from roof to roof silently, but during the day he dons kimonos and powders his face,transforming himself into a beautiful lady (known as 'Osei') so as to collect info for the Shinsengumi. Like most shinobis Susumu has a cold, indifferent attitude to those around him, particualry his peers and people he considers weak (such as Tetsu). Susumu is rarely seen losing his temper but with Tetsu he was the first to do that.